Rivers of temperate climate of Cyprus and the Country of China which meets at pacific ocean is the natural habitat of Grass Carp. This fish has been transplanted in various countries of temperate and hot climate and now it is known as major edible fish of those countries. Originally Grass Carp is the fish from the Country of China. 383 fingerlings on an average age of 5 months and 1.5 gram of weight with an average length of 5.5 centimeter had been brought to india on 22/11/1959 from Hong Kong, and was kept in the Kila fish farm of Central international Fish Research Institute Cuttack (Odisha) of India. Today it is supplied from here and being reared in all the ponds and reservoirs of all territories of India. Long body, slightly flat, wide mouth and curved downwards, comparatively small lower jaw, small eyes, small rear fin, both sides of tail flat and pharyngeal teeth compatible to eat aquatic grass and leaves, back and both sides of body is bright golden in color and white abdomen. Mainly it habitats in middle and lower level of water, and usually swims close to embankment of ponds in search of food. More than 150 mm long Grass Carp eats different types of aquatic and terrestrial vegetation, potatoes, grains, rice bran, cabbage and leaves and stems of vegetables. During various scientific studies it is found that the Larvae of Grass carp eats only plankton and the fingerling of 2 to 4 cm length eats aquatic vegetation. In India It has been observed in large Grass Carp fish, that the fish of 1 Kg weight eats up to 2.5 kg hydrilla in a day. The growth rate of Grass carp mainly depends on the accumulation rate and the quantity of food given to it every day. It grows very fast usually it becomes 35 to 40 cm of length and more than 2.5 Kg of weight in a year. The age and size in which the Grass Carp matures, it varies according to its natural habitat and transplanted habitat. In India the male Grass Carp attains the sexual maturity at the age of 3 years and the female Grass Carp attains at the age of 2 years. Grass Carp breeding only once in a year. Although some species has been found breeding recursively in riverine system of Amur due to variation of temperature in Russia. Today, almost in all the states of India the actuate breeding is being done by stripping method in puddle. It's Spawning capacity is estimated on an average 75000 to 100000 eggs per kilogram weight. Grass Carp eggs are spherical in shape and its diameter is 1.27 mm and it increases up to diameter of 4.58 mm after being fertilized. According to Indian conditions the hatching takes 18 to 20 hrs at 23 to 32 degree temperature, and the size of Hatchlings has been estimated 5.86 to 6.05 mm. The yolk sac dissolves completely after 2 days of hatching. 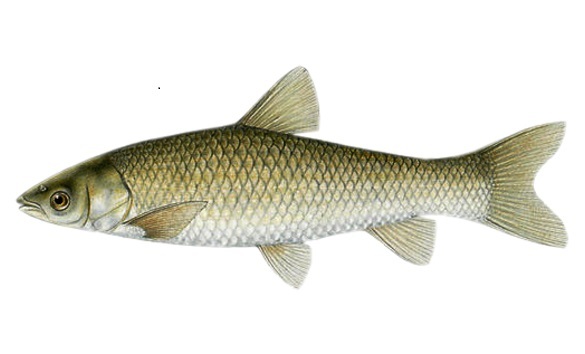 Grass Carp is basically the fish of China, and it has been brought to several countries of the World to control the weed in aquatic environment. On the basis of experiments it has been found that its inclusion is beneficial enough in mixed / intensive rearing system of Grass Carp and it is also useful to control aquatic weed. In enrichment ponds its numbers for accumulation is determined on the basis of area of the pond. According to the feeding in the period of one year it becomes 2 to 5 kilogram of weight. The market rates of Grass Carp is very good, and the customers prefer to buy it.